DEDICATED TO ALL THE iPhone enthusiasts, from Rapper AC with all sorts of little snippets that evoke a little Web 2.0 and a lot of creative license in this mash-up from Yael Naim's "New Soul". I'm trying to make my blog pages mobile-friendly so I've also cut this clip as 3GP and MP3. I PLAN TO SET STUDIO TIME inside several Irish pubs next academic term where I award academic credit to those who prove they observe and take note. These are important skills because few creative multimedia students begin their studies with the ability to check out their immediate environments. I think it's important to stop and try the analog journaling thing, and I try to sketch a note, not just write down a though. It's also important to sit down at regular intervals to annotate ideas. 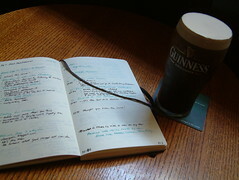 Ideas have short shelf lives because we can forget them even before starting in on our second pint. I take audio notes and also spend time doodling with ideas. "Book them," advised Mick Wilson the art cynic. So I take notes and I take inspiration from Leonardo da Vinci, arguably history's most famous note-taker. I have a copy of sketches from one of his notebooks, sketches on nature, art, engineering, and architecture. Back home on the east coast of the US as a high school student, I thumbed through a few of Thomas Edison's scruffy notebooks. I learned by looking at these samples of work. 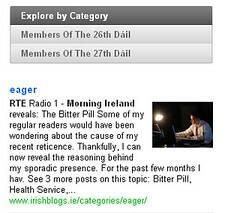 JUST AFTER LISTENING TO my main man Damien Mulley explain Cuil (rhymes with "cool") to Morning Ireland listeners during the morning commute rush hour and through the static comes the message that Cuil is cool, maybe a Google option (especially for those concerned about the State hoovering their private search details), and that there's an Irish link to this emerging search engine. We had a look at Damien Mulley and Morning Ireland as viewed by Cuil and found a representative cross-section of results. Cuil does the presentation well with a "new perspective on search", following the same kind of screenscape as Alltop Ireland. Viewers can see at a glance stuff that might be real content or spammy content and astute searchers can decide what to click on and read. Unlike Google, Cuil does not harvest IP addresses on queries and that alone may attract early adopters to its service. Cade Metz points out some other interesting facets of the Cuil service (NSFW). Sarah Carey attracts dozens of comments about Cuil on the day it launched..
Damien Mulley as an MP3 (not a podcast, just a 4-minute clip with loadsa static). And the Podcamp Ireland planners talking about Cuil (another 4-minute clip). IT'S SUMMERTIME IN IRELAND and there's a lot of digging and filling in the back garden that has to get done, so don't expect much to be written on this blog through the end of August 2008. Now get back to work. Or listen to me babble on Twitter. THE BACKGROUND SHUFFLING on today's Qik View of Sunday Technology comes from our kitchen where a happy toddler discovered I could not turn newspaper pages with a single hand. So Mia scampered off with a few items that didn't make the recording session. I think she objected to the way I was using her Kungfu Panda as a key frame in my video segment. We rocketed through the Sunday Times and the Sunday Business Post, partly because the rewarming season has started (i.e., old press releases make the pages) and mostly because it's warm outside our kitchen. Too bad the Sunday Tribune has lost its way when covering Irish technology. Right! It's a lovely summer Sunday here in Ireland which means we'll be outside more than in today, trying to hack away at long grass that's taking over the back garden. IF YOU'RE LIKE ME and you have to spend several hours a day resting the palms of your hands near a computer keyboard, you might need a foamy baguette to help you stay on top of things. Or you might decide to save the €20 and just buy yourself a few baguettes and dip them in fresh water for the squishy feeling that you'd get from the futuristic gel foam in this little number. It's sold to help alleviate wrist strain. Nearly 1000 references point to this office accessory and during the past 14 months, it's increased in price by more than 10%. WHILE A LOT OF PEOPLE stroke their iPhone screens lovingly, the big computer giant Hewlett-Packard has been working on an array of products that use the same kind of finger-tapping interface. And their first samples are in Irish computer shops, giving me the opportunity to play with the Touchsmart screen at left. I believe touchscreens are the preferred method of using a computer in a non-technical environment, even though I've seen effective touchscreen usages in hospitals and delivery vans. 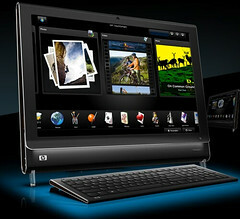 Touchscreens are the interface of the future. I'm impressed with the technology and plan to save the money required to mount a Touchsmart device in my sitting room. I'm thinking about designating a corner area where people can tap away during a television show or while watching a DVD on a main screen across the room. I know it's something I'd like to do during the evening news because I think a lot of stories on the main news shows need fact-checking. GETTING READY TO HELP several packs of American tourists around Ireland, and one of the most predictable questions is "Where can we get good sushi?" When I first arrived in Ireland in 1994, I couldn't answer that question without heading across the border. Today, with the help of LouderVoice and a Lazytweet, I've got some ideas that will guarantee satisfaction to all sorts of my American friends. We have Yamamori Sushi in Dublin with a four-star rating for their Bento Box, Aya Restaurant behind Dublin's Brown Thomas, the sushi vendor's stand in the Temple Bar Food Market on Saturdays, and Yo! Sushi! in Swords, close to the Dublin Airport. All these fixtures will prove important as we map out our sushi crawl for enthusiastic twentysomethings visiting next week. Recommendation: Bookmark look-ups on LouderVoice when searching for high-quality value for money in Ireland. AFTER MORE THAN THREE WEEKS without the use of wired broadband service, I've learned enough about how to leverage portable broadband connectivity for e-learning. More importantly, I've reaffirmed my faith in text messaging (without becoming as avid an advocate as Liam Burke), I've rediscovered the elegance of mail-to interactions, and I've concluded that social networking works a charm when it's portable and prescient. FROM PERSONAL EXPERIENCE with the Nokia E90 reading me its maps and after more than 1000 miles using the Garmin Nuvi 360 to take me around places unmarked by signs or road stripes, I know how you need to balance the advice of a GPS. I have used GPS devices while driving, walking and cycling. You cannot depend on them unless you know how they think. And as several red top British newspapers report, you shouldn't think you'll get away with stupid driving just because you followed your GPS. "In the UK, a ridiculous 300,000 car crashes have been caused by GPS. According to a survey commissioned by The Mirror , 1.5 million drivers have swerved through traffic when following their sat-nav's instructions a little too closely". Charlie Sorrel says, "The list of errors caused by slavishly obeying absurd commands would be hilarious if they weren't so dangerous: Driving onto a railway line, heading the wrong way down one-way streets, hurtling headlong into ditches, getting stuck under bridges and ignoring road signs." Charlie Sorrel -- "GPS Causes 300,000 Brits to Crash" in Wired's blog, 22 July 2008.